The reality star Kim Kardashian displayed her flawless curves in a matching gray hoodie and tight leggings. TV Personality Kim Kardashian is here to remind us we can still flaunt our curve and body in tights. The star recently spotted out and about in Los Angeles, California opted for gray tights and hoodies to flatter her flawless figure. As the mother of three looked effortlessly beautiful and healthy in the gray tights, the reality tv star decided to lay her long weave hair free. Kim K out in LA displaying her flawless figure in gray hoodie and tights. Seems like Kim developed an obsession for a black weave. In contrast, her sister Kylie Jenner changed the hair color into a blue one. The tight gray hoodie Kim wore comes from Yeezy season 6 collection, designed by his husband Kanye West. The price of the Yeezy hoodie Kim wore comes in an estimated cost of $335. And as soon as Kim K hit the Sherman Oaks, people in the street were already staring at her. The stunning Keeping Up With The Kardashians star walked off the street all alone by herself. The 38 years old holding a cup of coffee didn't appear to carry any bags and phone with her. As a matter of fact, the jewel loving celebrity didn't even seem to be wearing any accessories. As per pictures, we can't even spot a single ring on her finger, not even her million dollars worth wedding ring. Interesting. 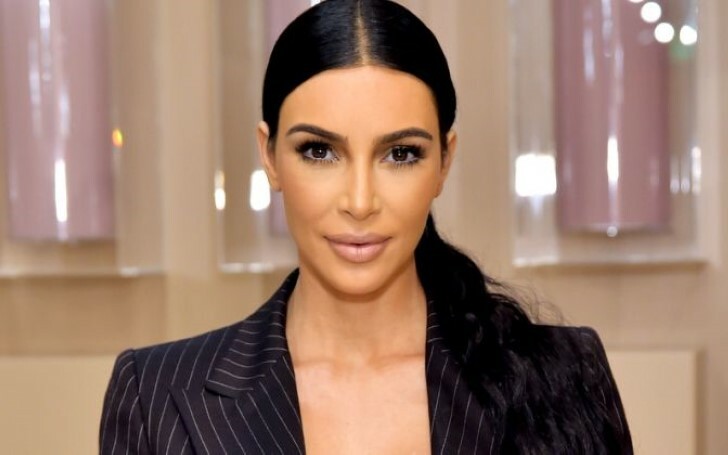 Nevertheless, the Kardashian who recently called out rapper Drake in defense of his husband looks elegant with or without jewelry. Kim K is expecting her fourth child via surrogate with husband Kanye West. Kim and Kanye already share three kids; North aged 5, Saint aged 3 and Chicago 11 months. The news of the fourth West was announced by momager Kris Jenner on Saturday. In addition, Kim and husband Kanye organized a huge lavish Christmas party last year where celebrity and a close friend of Kim, Paris Hilton included as one of its VIP guests. The whole Kardashian clan including sister Kortney Kardashian, Khloe Kardashian, Kendall Jenner, Kylie Jenner attended the party as well.